For years I have been on an endless search to figure out what my message to the world is. What is that tiny seed of knowledge that God has shared with me that He wants me to cultivate, grow and share? In 1st Corinthians 12, Paul shares with us that we all have spiritual gifts. That the Holy Spirit works through us so we can help each other. What exactly are we supposed to be helping each other do? How do we grow strong in our love for Christ as one body and share His love with the world around us? …but some of us, like me, have to dig deep to figure out what theirs is. It seems as if our message is ever evolving as we are always growing and learning through different seasons of life. Would you agree? What I mean by “message” is how we as individuals share the message of Christ. That is the message we should be sharing…. Because we are all unique in who we are, our messages are going to sound different. This is awesome as we are able to use our own individual gifts and voice to reach more people. We can use our story to reach people who relate to us. 1 Corinthians 12:1-11 talks about how we are each individual and diverse yet He is the same and the Spirit works through us individually as He sees fit. I am fascinated in how we are all so different, will speak God’s message differently, but it will all mean the same thing. We get to share this by living a life in Christ and being lights to the world for Him. So we need to speak from our hearts the message that we have been given Christ and share that with others. Use our own gifts and words to share this with others. It sounds simple enough but the enemy gets in there and starts screwing everything up. Satan creates challenges to distract us, confuse us, with the ultimate plan of stopping us from sharing the Good News to the world! God never gave up on me, and he has zero plans to give up on you either! Our sinful nature is why it’s so important to keep our heart in check with God with what we are working on, and that we always ask Him to lead us in all that we do. 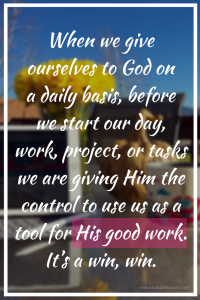 When we give ourselves to God on a daily basis, before we start our day, work, project, or tasks we are giving Him the control to use us as a tool for His good work. It’s a win, win. 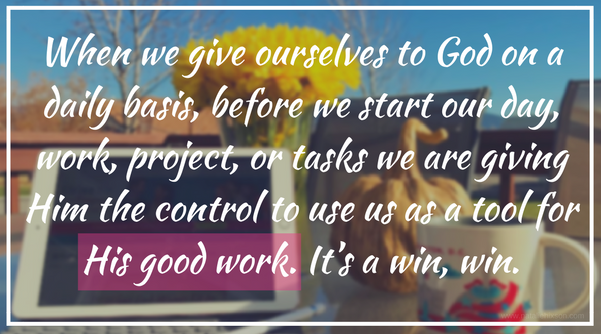 We get to give all the glory to Him and trust that He will use our work for His purpose. The responsibility is off our shoulders and onto His. He gets to decide what our message will do and who it will reach. It’s so beautiful and freeing! With all this being said, today I am sharing with you the message I believe He is using in my life right now to help me grow and to help others too. I am filled with pure joy that He is using me, even in the challenges…especially in the changes. I feel safe and secure because God’s got it – me and my work that is. I am learning how to live a grace-filled, authentic and intentional life. Grace Filled – To love others the way God loves others. To treat others the way we want to be treated. Love! Love is described well in the fruits of the Spirit as well. It covers all sins. To allow for each other’s differences and move on. Knowing that you are not perfect and that God knows that. That is why we have Jesus and we get to lean into Him and receive forgiveness for our sins. Authentic – To be real with me, with you, with others. To stop pretending I am anyone else but me. To accept who I am in Christ and know that I am loved, cherished and a confident woman in Christ. Not being ashamed of sharing Christ but being real and sharing how He has worked in my life. So that He can use and share my story with others to bring glory to Him. Intentional – To be on purpose for Christ. To serve Him, my hubby, my kids, my family, my friends, my church family, my followers, the strangers I meet. To wake early, start my day off with Christ, and follow His lead for the rest of the day. To put my goals and dreams aside and to pick up His goals and dreams for my life. To lean into Him in every challenge and blessing. My prayer and hope are that this message of mine speaks you your heart in some way or another. We are all just sinners saved by the grace of Jesus Christ. And not one of us is better than the other. We who chose to believe in God are made new and perfect in his eyes. And that is all I hope you ever understand from me. Never will I purposely put someone down, make someone feel less than and think that I am better. I will screw up, I will hurt others, I make mistakes but thankfully I have a loving and gracious God who will make things new again and gives me unconditional, eternal love and forgiveness. …you are WRONG – You ARE good enough! You, me, the perfect looking gal on Instagram the ragged homeless woman in the city streets, we are all the same to Him. Loved and His. Please reach out to me if you need prayer or just a shoulder to lean on. I can’t say I can fix you, that’s Jesus’ job, but I will give you love and light from Him, only through Him working through me. God Bless you. You are good enough!